TONY CLIFF is a contributor to the Flight series of anthologies, has been nominated for Shuster and Harvey awards, and has three times been nominated for an Eisner award. 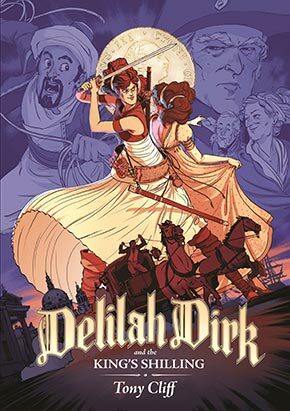 Delilah Dirk is his first published graphic novel. Having survived a close shave in England, where she was falsely accused of spying for the French, Delilah has set out with her companion Selim for more agreeable adventures in central Asia. But when she stumbles on an artifact that may be a clue about the location of the legendary third pillar of Hercules, Delilah and Selim are drawn back to Europe on an Indiana-Jones-style archaeological caper that pits her against a ruthless enemy... and forces her to team up with the most unlikely partner of all time: her sworn enemy, Jason Merrick, the man who framed her for espionage! 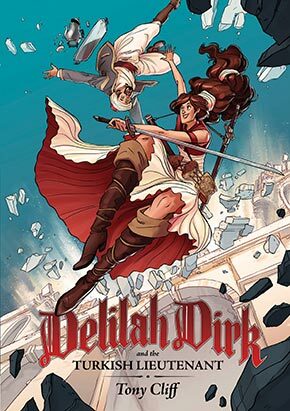 Globetrotting troublemaker Delilah Dirk and her loyal friend Selim are just minding their own business, peacefully raiding castles and and traipsing across enemy lines, when they attract the unwanted attention of the English Army. Before they know it, Delilah and Selim have gotten themselves accused of espionage against the British crown! Delilah will do whatever it takes to clear her good name, be it sneaking, skirmishing, or even sword fighting… But can she bring herself to wear a pretty dress and have a nice cup of tea with her mother? Delilah Dirk may be defeated at last. By tulle.